Students who are selected into Trilogy automatically qualify to participate in the Utah All-State Choir. This is an SATB choir composed of 650 of the best choir students from all high schools in the State of Utah. Pine View can nominate 8 to 16 students (in balanced quartets -- SATB) to participate. Students are given music and learning MP3s with a couple of weeks to prepare for Area Rehearsals and Pass-Offs (held at Dixie High School -- see calendar). Following the area pass-off, students work with some of the greatest directors and clinicians in the choral world. Past conductors have included Mack Wilberg, Craig Jessop, James Jordan, Z. Randall Stroope, and many others. Rehearsals are held in Salt Lake City on Thursday evening, all day Friday and Saturday afternoon culminating in a Grand Festival Concert held in the LDS Tabernacle on Temple Square on Saturday evening. In 2016 the All-State Conductor is Dr. Rollo Dilworth (Temple Universisty, PA). The cost is generally usually $175 per student and includes registration, a three-night hotel stay and transportation. The selection process begins with Trilogy returning members (seniors) receiving highest priority, then next to all Trilogy seniors, then returning members (not seniors), then all juniors, then open to the seniors in concert choir. Please express your interest on your Trilogy Information Form and you will be notified if you are selected to participate. Eight students represented PVHS in the Utah All-State Choir. Taylor M, Kelton J, Nathan B, Kaden D, Taylor B, Maquel M, Cierra P, and Zoey B all sang in this 640 voice choir. 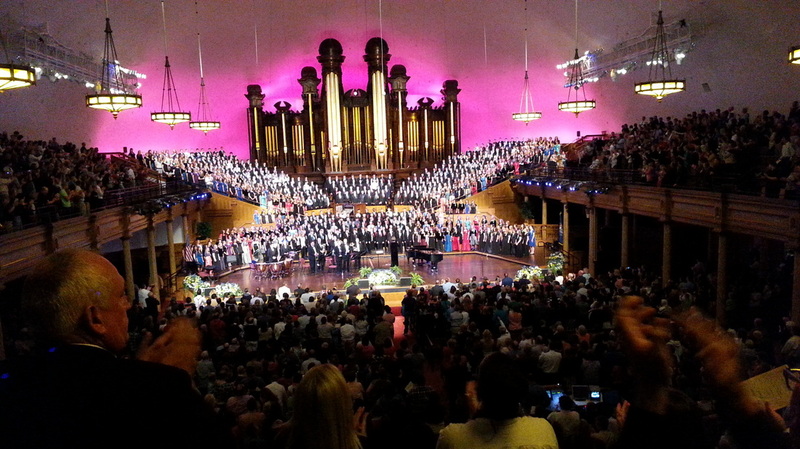 Fifteen hours of rehearsal culminated in a Grand Festival Concert in the Tabernacle on Temple Square in Salt Lake City. Great job! We WORKED and WORKED...and played.